I played 5e D&D tonight! Like most of the nerdo-sphere, I signed up for the 5e D&D playtest (I ain’t calling it “D&D Next”, because then I’ll have to call the next edition “D&D Next 2”). And tonight I ran the adapted version of Caves of Chaos for some friends instead of painting miniatures. Before I get into what I liked and didn’t like about the playtest, some bona fides. Everybody in the group has played or is still playing B/X D&D. One of the guys is an active player at Red Box Vancouver, one of the guys was a DM for RBV in the days when we had more players than we could handle, and two of the other players were not only active RBVers, but were with me when I ran Basic Fantasy way back in 2008 and first started on this whole retro-roleplaying thing. Of the group, we’ve all played a metric ton of 3e. I’m not sure about the active RBVer, but me and the other DM dropped out of a 4e group after about 6 months and the other two players stayed in the 4e group for a few years–and they both still really like a lot about 4e. So we’re not all dyed in the wool OSR evangelists, but everyone is Old School Friendly at a bare minimum. So… the playtest. We started our game right at the edge of the ravine, the halfling rogue (all characters are pre-gens) looked for and found a track leading to a cave hidden in the trees (no roll). He crept up to the cave, spied it out and was about to head back to the party when a gang of Kobolds threw a spear and dropped out of the trees to attack (he described peering at the cave entrance and trees for guards, but bombed a stat check to notice the hiding monsters). The halfling won initiative and ran back to the party with the monsters in hot pursuit. He was narrowly missed by a rusty dagger hurled by one of the kobolds (ie dagger -2, hit him for 3 points of damage, but in 5e the text says that until you are below half hit points, you haven’t taken any physical damage). By then the rest of the party had come out of hiding. The elf wizard fired, what else, magic missile (automatic hit, AD&D-style). The player, who is especially fond of playing Magic-Users in B/X, was thrilled that magic missiles are an unlimited “cantrip”. He was also pretty excited that wizards get three spells at first level, instead of the usual “Sleep or nothing” of 1st level B/X. The lead kobold dropped like a sack of potatoes. The wizard’s player was also very happy that 5e lets you split your move, so he could run within range, cast his spell, and withdraw to behind the safety of the fighting-types. Next the dwarf fighter and human cleric attacked. The dwarf fighter fired his crossbow at a kobold, killing it. The cleric called on the power of Pelor and a radiant beam from heaven burned another kobold alive. In subsequent rounds, the kobolds took a few hit points off the halfling before he was able to slip into the treeline and hide. Then he was able to dash out from cover and stab from behind, giving him “advantage”, which means you get to double your chances to hit. The dwarf went to town with his two-handed axe, and discovered that even when he misses, he does some damage with an ability called “close call”. The player seemed to like that a lot (she is a 4e fan and that mechanic is *very* 4e). I don’t remember if the cleric used his radiant beam spell again–I think it may also be an unlimited orison, much like the wizard’s magic missile. I do remember that the wizard used his split move to go all Emperor Palpatine on some unlucky kobold (shocking grasp… total overkill, but a lot of fun). In any case, the kobolds routed and were cut down as they ran, except for one that surrendered and was taken captive by the halfling. After much ridiculous roleplaying by yours truly, “Meepo” led the party into the cave where he promised to introduce them to the Kobold King. Here’s where I should mention the “hook” for the adventure that I used, from a list of possible ways to interest the players in the dungeon. Although the adventure suggests several ways to introduce the dungeon, including the tried-and-true “there’s gold and monsters, what else do you need to know?”, I thought it would be more interesting if the players were tasked with opening diplomatic relations with the monsters, offering tribute from the nearby towns if they would leave off raiding. Speaking of the adventure, it’s practically a love letter to the OSR. 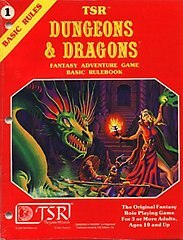 Not only is it an extremely faithful port of the Caves of Chaos, arguably the most influential dungeon ever written, but it specifically encourages sandbox play over plotted adventures, suggests parleying with monsters, the possibility of TPKs from reckless exploration, playing off factions against each other, etc. There’s also a lot of rules text devoted to the idea that the rules should get out of the way of running the game you want to play. The designers are definitely paying attention to the OSR blogs. The players ended up sending the wizard’s familiar (a cat) to scout some of the kobold lair while they negotiated with the Kobold King, attended a meagre feast in their honor, impressed the yokels with a display of magic (Light + Mage Hand FTW!) and successfully negotiated an exchange of a promissory note for four scouts and the lowdown on “The Master”, some sort of necromancer who has united the tribes through fear of his power, plus information about a still simmering feud between two of the orc tribes that could be exploited. It’s 1am and my kids are going to wake me up in six hours, so I’m going to end this with a couple of lists. Helping rules: finally, a way to meaningfully help another character! Simple combat: splitting up your move made combat way more fluid, as did the absence of Opportunity Attacks and all that standard/minor/move/swift action hair-splitting. Stat checks: seemed like a nice compromise between old-school “roll under your stat” house rules and modern skill systems. I wasn’t keen on the Close Calls fighter “I missed but still did damage” power. But then again the whole “I hit but since hit points are abstract didn’t hit (or maybe I did)” design is a muddle (albeit a beloved muddle), so I could change my mind. No morale rules or reaction tables. The first seems like it would fit really well with the streamlined combat, the second with the emphasis on “interaction” as one of the three main pillars of play (Combat, Exploration and Interaction). No wandering monsters. Not much resource management yet. I’m really curious to see how the at-will wizard/cleric cantrips/orisons will play out. The players seem to love it, but I wonder if I’ll miss the game of resource management that is the Magic-User in B/X. Ditto for hit points and healing, the characters have a ton of hit points at first level (equal their Constitution score and then some). They also have the ability to recover some hit points if they rest right after a fight, which looks a lot like healing surges from 4e, but also reminds me of the very common “bandage yourself for 1-3 hit points” house rule in OSR games. Only it’s more like 1-8 hit points. I haven’t looked at the characters much, but they seem to have 3e/AD&D style stat inflation (ie 4d6 drop 1). The players seem excited to be so much hardier. I’m curious to see if that will translate into their being “fool-hardier” or just invincible.